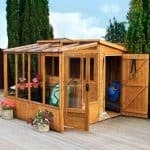 At first glance the Windsor overlap double door apex workshop shed doesn’t exactly ooze style and durability. It is created with budget in mind and though its rough finish may give it a more rustic design, it certainly won’t appeal to everyone. The good news is it is possible to change the look of the shed by using a coloured treatment. Though it may lack in style, this shed does have a few redeeming features. For example, the 3’2” double doors are a lot wider than your average shed. This means there is no limit to what you can fit through its doors. The only thing you will have to worry about is the strength of the floor. As you’d expect from an overlap shed of this price bracket, the floor is created from solid sheet materials. It may help to lower the price of the building, but it feels very flimsy. So if using it as a workshop, for peace of mind it would be worth adding another solid sheet on top. There are 4 styrene fixed windows supplied and they can be added to any side of the building. They offer great lighting throughout the day and have a small drainage feature underneath to stop water seeping through. This shed isn’t designed for heavyweight storage. The floor could be upgraded if you have DIY skills however. This is a large, overlap wooden building that can be used as a storage shed or workshop. If you will be using it as a workshop however, strengthening the floor would be a good idea. Part of the Windsor range, this shed is slightly shorter than some of its competitors, though it still offers a lot of height inside the building. The doors are extra-wide, enabling the storage of bulky and large tools, equipment or machinery. Solid sheet is used to construct both the roof and the floor. The only foreseeable problem with this is that workshops need a solid, strong floor to not just accommodate heavier machinery, but also to enable you to walk around with peace of mind. Sadly the floor of this building doesn’t feel very rigid. Solid sheet isn’t exactly going to break easily, but it doesn’t offer a particularly strong feel underfoot either. It certainly isn’t designed to hold heavy items. So for that reason unless you only plan on storing light items, it would be worth spending a little extra time and money upgrading it by adding an extra solid sheet of wood on top. The apex roof has a gentle slope which not only ensures the shed is tall, but it also helps to maximise rainwater protection. Rain will literally just run right off instead of building up and soaking through to the timber. A standard 28mm x 28mm frame and 8mm overlap cladding is used on this building. Now the key thing to remember about overlap is that it isn’t as durable or as strong as tongue and groove. It is weatherproof providing you treat it annually, but it isn’t possible to hammer nails into the interior walls, or install shelving. The timber is also more exposed to warping so when installing it in a sunny part of the garden we’d highly recommend using a higher quality treatment to keep it protected. Spirit based treatments will help to not just protect the surface of the overlap, but also the interior of the wood. A water based treatment like the one provided will offer adequate protection for a year, but during harsh weather the barrier it provides could get worn down. So a spirit based treatment will offer reassurance, as well as a more effective weather barrier. 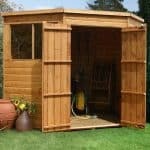 A 10 year anti rot warranty is supplied with the shed as long as you maintain it with yearly treatments as recommended. The doors on this shed come with extra-wide measurements. Taking into account that the average shed door measures 2’2”, the fact that these ones measure 3’2” wide is a huge difference. It means no matter how bulky the equipment or machinery is that you plan to store, you’ll easily get it through the doors without any struggle. They aren’t braced and they aren’t heavily hinged either so sagging may be a concern if you use the shed on a daily basis. However, adding bracing to the door will fix this. The 4 fixed square styrene glazed windows offer good lighting, but won’t provide ventilation. Styrene is known for its fantastic shatterproof benefits which means the windows on this shed are safer than glass. You won’t benefit from much privacy with this building. Whilst the windows can be installed either side of the shed, they cannot be covered with curtains due to the weakness of the cladding. 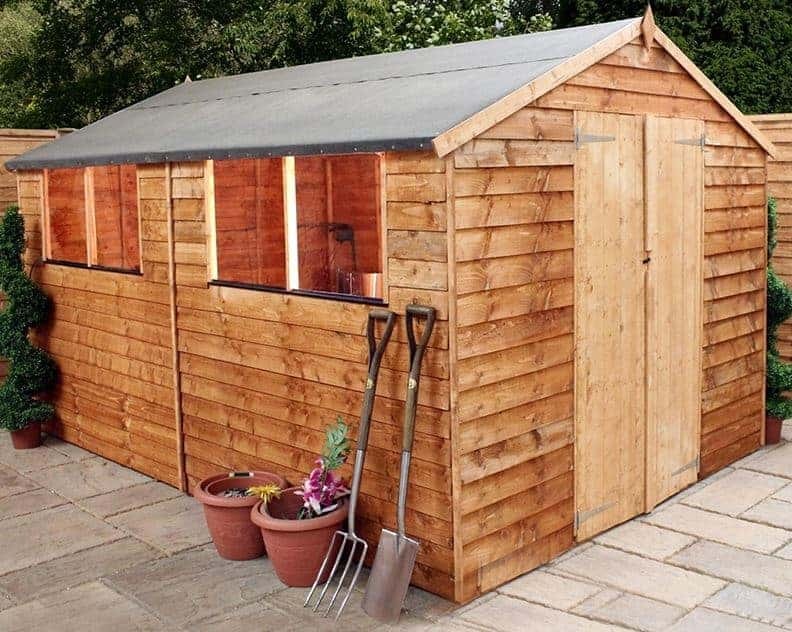 So we’d mainly recommend this shed for those with more secure gardens. The security also leaves a lot to be desired. There is only a button catch added to the doors so a padlock isn’t an option unless you invest in a hasp and staple too. These aren’t very expensive but it is more of a hassle to have to install one and then a padlock to keep the building secure. You are presented with three extras with this shed and two of them are particularly worth considering. The most useful is the Portabase DIY Timber Base Kit. Helping to provide a very firm base to assemble the shed, it comes with spikes to attach it firmly to the ground. These will only be useful if you’re not assembling the shed on concrete. 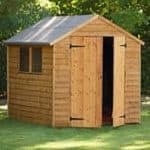 Just like the shed, it comes with a 10 year anti rot warranty and unlike a lot of bases it is supplied alongside the building, meaning it can be used the same day as you erect the shed. Treatments are also offered, though remember the shed does come with a free treatment. 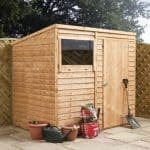 As it is a large shed it is worth buying another treatment or two just to ensure you have enough to regularly maintain the building. The fact there are also different colours to choose from is a benefit. Overlap isn’t very stylish so adding a different colour can help to make it more visually appealing. The least useful extra offered is the DIY Assembly Assistance Kit. Now the tools supplied in this kit are very useful if you don’t already have them. Brushes, a safety knife, hammer, safety goggles, saw and spirit level are included. If you’re unsure whether you have all of the right tools to assemble this shed then this would be a good investment. However, if you are a DIY enthusiast then it is likely you already have these tools lying around. Being an entry level shed, there are elements that could definitely be upgraded. Considering the cost, you are getting a good quality shed, but it definitely isn’t the highest quality model available. Like most Shed Store buildings, this one is offered with a 10 year anti-rot guarantee. This only applies if you treat it annually. One of the best things about this shed is the sheer level of interior space offered. It provides more than enough room to store anything you need to. Considering its size this is actually a very easy shed to put together. It comes with full instructions and all of the panels reportedly fit well together. The Shed Store even state it will only take 3-5 hours to assemble. The low cost of this shed is outstanding. However, there are quite a few things that you will need to upgrade. Saying that, most customers do feel they are getting excellent value for money with this building. 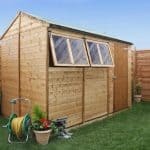 Final Thoughts: Great for those on a budget, the Windsor overlap double door apex workshop shed offers good value for money. It isn’t the best looking model on the market, but it is one of the most affordable. The apex roof gives it a traditional design whilst also creating an extraordinary interior height. The main feature of this model is the wide double doors. Most sheds of this size come with double doors installed, but the ones on this shed are wider than average. It focuses on practicality as well as affordability. The pressure treated floor joists add a little more stability than untreated competitor models, but you will still need to be careful if you plan on using this as a workshop.